I ordered the two sandwich deal thinking that the sandwiches might be small. They were huge. The NY Style Sausage had a lot of tasty peppers and onions on it. The sausage looked and tasted like keilbasa. My favorite of the two sandwiches was the Classic Frank. It comes with chili and melted cheese on top. It was very good. I couldn't finish either of them because there was so much food. The service was very friendly. Customer service was fine but I found the food to be of very poor quality. The "hot" dog was cold, the "melted" cheese was cheese wiz and the "fried"
Customer service was fine but I found the food to be of very poor quality. The "hot" dog was cold, the "melted" cheese was cheese wiz and the "fried" onions were French's from a can. I was expecting more for my money. My order was a New York Style sausage with onions and peppers. They put so much peppers and onions to try to cover up a jumbo size hotdog and for a person who cannot have hotdogs it is good to double check. To ensure it was indeed a hotdog, I had a colleague taste it. I took my hotdog in disquise back to the truck and received my money back. I like that they slit and grill the dogs to order, giving them a bit of a snap when bitten. What they call a "NY Style Sausage" is really just a spicy hot dog -- very different than the picture on the truck, which looks more like an Italian sausage. It was OK, but no what I expected. The dog in the potato frank was good and beefy, but the toppings (whiz, potato salad, & potato straws) were too much for the bun, rendering it a compete mess before I was half way done. I was served a jumbo hotdog disguised as an Italian sausage, too much dill in potato salad side, chips were non-existent. Bottle of water was refreshing. I ate the peppers and onions off of the hotdog -- very flavorful. Jumbo hotdog went in trash. Potato salad was enjoyed by a friend. I am going to rate this with two stars only because if you are someone that likes a jumbo hotdog you might have enjoyed the sandwich I was served. This was my first time at this truck and tried the advertised $10 combo (2 dogs and bag of chips) that cost $11 - tax I guess. After what seems a good amount of time (almost 5 minutes and there was no one else in line), I got my food and went back to my office. First the Mexicana frank - bun was soft, hot dog good but not hot/not cold, guacamole was not smooth but grainy, jalapenos where fine, melted cheese was processed. Too many processed/pre-made ingredients. If they concentrated on fresh guacamole and something better than cheez-whiz, it could be a good hot dog, especially if it is HOT. Not so much right now. Second, the potato frank - again soft bun, good dog not hot/not cold, potato salad out of a bucket, cheese again processed. Again, homehade potato salad and real cheese would have been better. Overall, not really impressed because too many pre-made/processed ingredients. If they fresh/home-made toppings it would be a great improvement. Don't think I will try them again anytime soon. 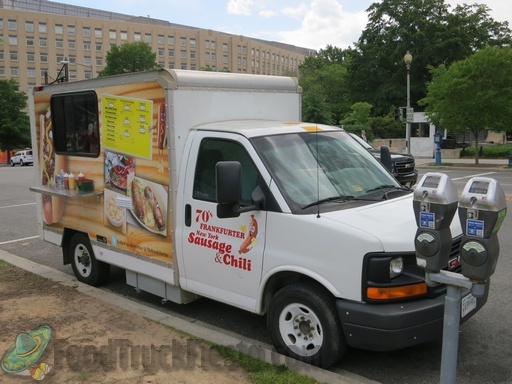 70’s Frankfurter food truck (formerly Krazy Koshery) started up on May 1st, 2013.